I have been reading this book recently, and as well have been working on reducing the excess sugar in my diet as a new year’s resolution. Farro has danced in my mind as a grain to try, but up until last week, I must admit, I had never tried it. Again, the student must be ready as they say, and this student took 38 years to be ready, but ready I finally am. My interest was first piqued when I saw this Instagram post from David Leibovitz. I looked at his listed ingredients, and I thought to myself, “How simple! I can do this!”. And try it I did to great result. I then went out to dinner last Friday to The French Market and chose their Farro Salad with avocado and tomatoes, topped with a poached egg. Exquisite. 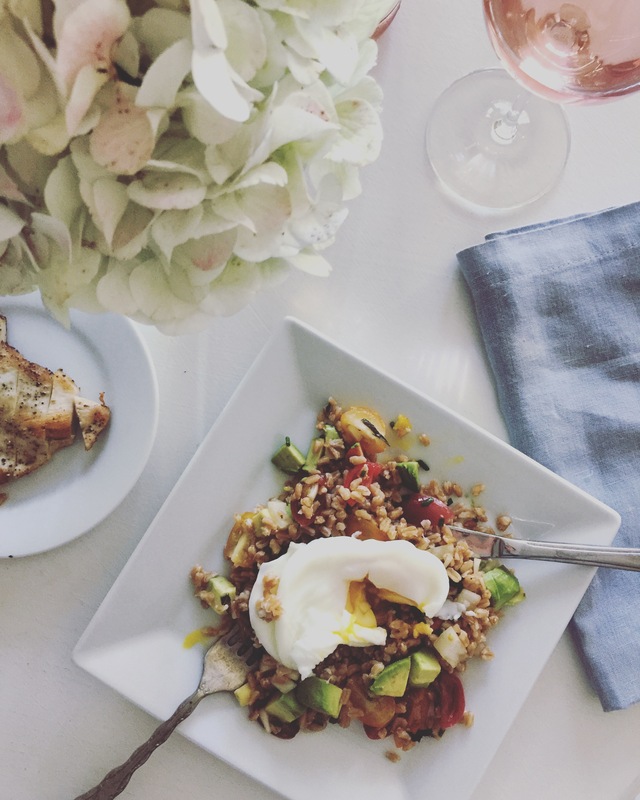 And that was when I realized, farro is just a whole grain to mix with what you love. Choose a dressing (I have made a simple vinaigrette, but you can just use olive oil as David Leibovitz did), chop up what you have in your refrigerator or your garden (I just tossed in my extra chickpeas because I didn’t want them to go to waste and chose purposefully the other ingredients) and enjoy. The benefits of the whole grain of farro are many. As an ancient grain that has been around for thousands of years and finds its origins in Mesopotamia, farro is Italian for “ancient wheat grain” which can describe three different types of farro: Einkorn, Emmer,Spelt. It has a nutty, chewy flavor which I love as I want substance when I ask it to stand alone as the main dish. Source of more fiber than most grains, similar to quinoa. In one cup of farro, 20% of the daily recommended intake of fiber can be met. 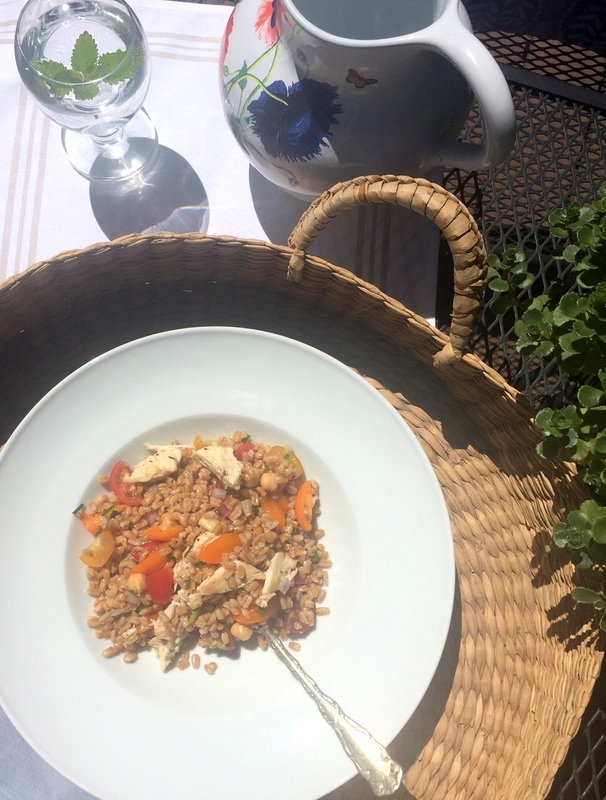 What I suggest is to try this recipe if you have never had farro. Then have fun with it and add the ingredients you most love. You will feel full and satiated, and over time, if the benefits listed above are any indication, far healthier as well. Enjoy! Toast the farro in a large sauté pan for 2-3 minutes. Dry. Toss the grains to make sure all are being toasted. This will offer more flavor from the grain. Place the toasted farro in a saucepan of 3 cups water and bring to a boil. Add salt. Once at a boil, reduce to simmer and cover for 30 minutes. While the farro is cooking, chop your tomatoes, onion, avocado, and herbs (chives & parsley). As well, in the saute pan you used for toasting the farro, place your tenderized chicken tenders (season with salt and pepper) and cook approximately 3-4 minutes on each side. (Tenderizing: place the tenders in between two pieces of wax paper, use your mallet (soft side) and pound until thinness you desire is reached.) Remove chicken from the skillet when done and let rest for 5 minutes. Then slice on the bias. Mix together the vinaigrette: garlic, balsamic vinegar, pepper. Then add the olive oil and whisk until emulsified. Once farro is done cooking, drain all excess water. In the same sauce pan that the farro is in, toss in vegetables, chickpeas, herbs and dressing. Mix until all is equally distributed and enjoy. You can also reserve the chicken and place it on top of the mixed farro salad. Optional: How to poach an egg simply without the fuss. Using a large skill, fill with water half-way up the sides. Bring the water to a boil (full boil). While waiting for the water to boil, place your eggs in a separate small dish (cracked and ready to go). When the water has reached boiling, slowing pour the egg into one side of the pan (you can place as many as 4 eggs in at a time in different places in the pan). Boil for two minutes. Turn off the burner, and let set for 1 and a 1/2 minutes. Remove and enjoy! YUM!! Great hint about toasting the grain, I do that with wild rice, but it never occurred to me to try with farro. Thanks, Shannon!